A superb 4 bedroom luxury holiday villa arranged on 2 floors with stunning sea, island and hillside views. The villa's design is an idyllic fusion of contemporary modern design and classic Thai style. 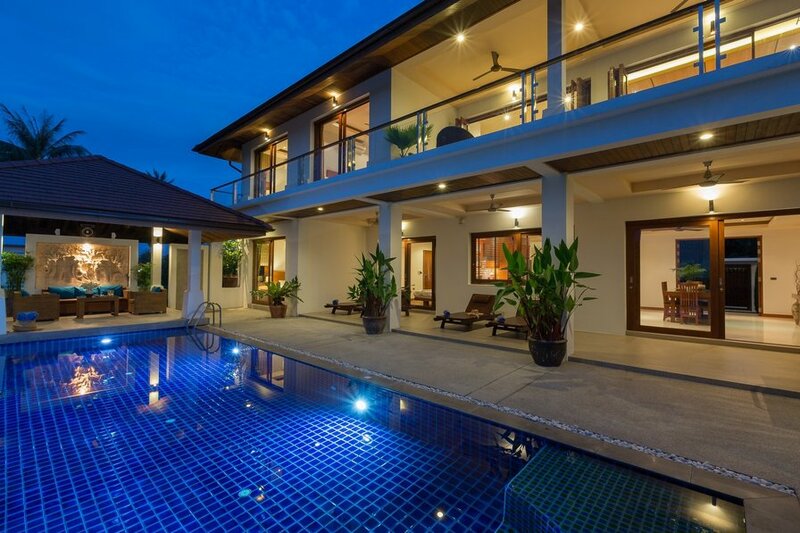 Nestled in the Bangrak hills, overlooking Plumeria Place, Peerapat Villa is located only minutes’ drive from the tourist hotspots of Bophut, Bangrak, Choeng Mon and Chaweng. Accessed via a concrete road, which is located only 100 meters from Bangrak Beach road, the villa is built on 1600 square meters of land - complete serenity and privacy is guaranteed. Four spacious bedrooms, all of which have sea views, each have their own unique design and furnishings. Master bedroom 1 is beautifully furnished with built in teak bed and a walk-in wardrobe. A sliding glass door leads from this bedroom to the upstairs terrace social area. The walk-in wardrobe reveals the entrance to an extremely spacious en-suite master bathroom complete with an oversized bathtub, contemporary design shower and twin glass washbasins. Master bedroom 2, also with beautiful built-in bed and wardrobe, leads to the pool-side area and to an en-suite bathroom (a double doored bathroom, also accessible from outside). Finally bedroom 4 has twin single beds (can be pushed together to form double bed on request) and matching built-in furnishings in teak opening onto the upstairs terrace. Bedroom 4 was completely refurbished in 2016. Bedrooms 3 and 4 both have adjacent shared bathrooms. •	Convenient location just 1.1km to Bangrak beach and town and within easy reach of surrounding tourist areas yet completely private with very spacious walled gardens. •	2 spacious master suites and 2 additional guest bedrooms all fitted with air-conditioning and ceiling fans and all featuring sea views. Both master suites are fitted with security safes and all bedrooms open onto the pool terrace or upstairs terrace. •	1x 42" plasma TV and 1x 49" Smart TV each with dedicated satellite system. •	Local Area Guide folder presented to guests on check-in showing nearby amenities, tourist conveniences and recommended nearby restaurants. •	Perfect accommodation for an extended family, two couples with kids and for sets of couples looking for a 4-bedroom Koh Samui sea view villa rental that doesn't break the bank. -Security/damage deposit of 20,000 Thai baht (cash only) is collected at check-in and refunded on check-out. Guests may pay in any equivalent currency.